Local (760) 948-0055 (7:00 to 4:30 Pacific Time) Mon-Fri.
1963-64 Fury stock Flat hood (race weight), minimal inner structure for reduced weight, uses 4 hood pins Full pin on 289.00 15. 1963-64 Fury 4-3/4" high cowl induction hood (race weight), minimal inner structure for reduced weight, uses 4 hood pins Full pin on 399.00 18. 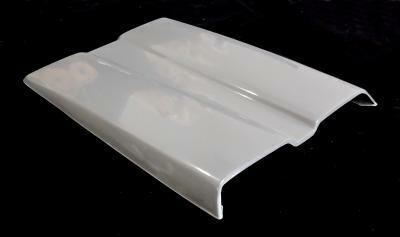 1963-1964 Plymouth Fury hood with 4-3/4 cowl induction scoop. Smooth grey gel finish. Fully hand laminated fiberglass. Sturdy inner structure for rigidity (PF-485 and PF-495). 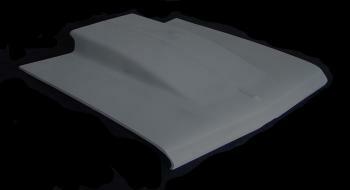 1963-1964 Plymouth Fury flat hood. Smooth grey gel finish. Fully hand laminated fiberglass. Sturdy inner structure for rigidity (PF-401 and PF-491). Copyright © 2014 Unlimited Products. All rights reserved. Follow us on FaceBook at "Unlimited Fiberglass"